The plan to create an organization emerged from groups working for religious heritage conservation and enhancement. 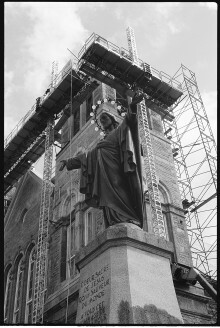 In 1983-1984, the Comité de construction et d'art sacré of the Diocese of Montreal obtained $15 million from the Canadian government for the restoration of 115 Catholic churches. In 1992, the first contacts were established with the Government of Canada with a view to multidenominational action. The same year, representatives of the Comité de construction et d'art sacré met with diocesan treasurers and gathered at a meeting in Quebec City to promote joint action on behalf of religious heritage. In 1993, following a meeting of representatives from the various faith traditions, the association Héritage Vivant was created. This organization, bringing together representatives of all faith traditions that owned religious heritage in the Montreal area, would become known as the interdenominational association Pierres vivantes/Living Stones. In 1994, a study presented an inventory of work to be carried out on 42 Catholic churches, five Anglican churches, three United churches, and three synagogues in Montreal, for a total investment of $75 million. That same year, association representatives met with the Quebec finance minister to examine the possibility of obtaining government funding to preserve religious heritage in the Montreal area. In 1995, Living Stones submitted to the Ministère de la Culture et des Communications du Québec a partnership project to pay for restoring and enhancing religious heritage throughout Quebec. 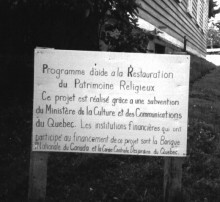 The Québec Religious Heritage Foundation was created and, on October 19, 1995, an agreement was signed with the Minister of Culture and Communications, guaranteeing an initial government payment to the Québec Religious Heritage Foundation of $35 million, over five years, for the restoration of Quebec’s religious heritage. In 2001, a review of the program’s 1995-2001 achievements was conducted, and the program management agreement was extended. In 2003, there began an inventory of Quebec places of worship (Inventaire des lieux de culte du Québec). Phase 1 of the inventory led to a tally of 2,751 open or recently closed places of worship belonging to all faith communities and traditions. This inventory included parish churches, non-Catholic places of worship, convent chapels, oratories, sanctuaries, and pilgrimage sites built before 1975. In 2004, Phase 2 of the inventory of Quebec places of worship involved heritage evaluation and regional classification of some l,600 places of worship inventoried in Phase 1 and erected prior to 1945. In 2005, the Québec Religious Heritage Foundation organized an international seminar on the future of churches, in conjunction with the Montréal Heritage Council, the Canada Research Chair on Urban Heritage of UQAM, and Concordia University. This meeting aimed to identify concrete solutions and ways to implement those solutions, focusing on three major themes: ownership status, use values, and urban planning. In 2006, in conjunction with the Faculté de théologie et de sciences des religions of the Université de Montréal, the Foundation organized the seminar Le patrimoine religieux du Québec: Éducation et transmission du sens. Based on seven major themes, the seminar addressed the following issues: dissemination of information problems; multicultural aspects; enhancement and appropriation; importance of Quebec’s religious heritage in modern culture; and, lastly, education. In 2007, at the general meeting, the members resolved that the organization be renamed the Québec Religious Heritage Council. This change was necessary to better match the new expanded mission of the organization to support and promote the conservation and enhancement of Quebec's religious heritage. In 2009, the Québec Religious Heritage Council, in conjunction with the Canada Research Chair on Urban Heritage of UQAM, Concordia University, and the Institut du Patrimoine, organized the conference Religious Houses: A Legacy. Organized around three main themes—ownership, use, and memory, this event aimed to identify and analyze innovative heritage solutions for the future of monasteries, abbeys and, more generally, religious houses, in Quebec, in the rest of Canada, and in other Western countries. In 2012, the first edition of the Forum on religious heritage is inaugurated. This event aims to bring together those involved in religious heritage to offer a new space for dialogue. The formula of the forum focuses on interaction between participants and guest speakers. In 2013, the heritage evaluation and regional classification of places of worship built between 1945 and 1975 was completed. The assigned ratings are available on the website of the inventory of Quebec places of worship. Furthermore, the Québec Religious Heritage Council launched its Award of Excellence to reward exceptional projects for restoration and site enhancement, which demonstrate the commitment, innovation, and passion of Quebecers for their religious heritage. In 2014, the Ministère de la Culture et des Communications announced that it was assigning management of financial assistance for restoration of Quebec’s religious heritage to the Québec Religious Heritage Council, accompanied by a $20 million budget. The religious use eligibility criterion was removed, so buildings with new uses are now eligible for financial assistance.